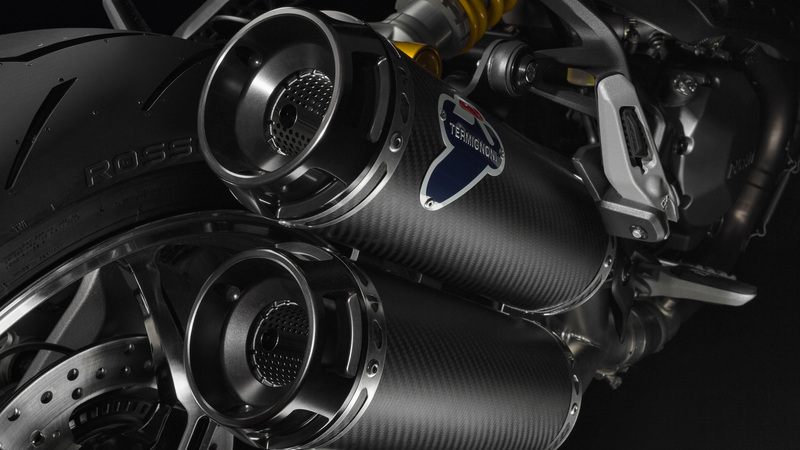 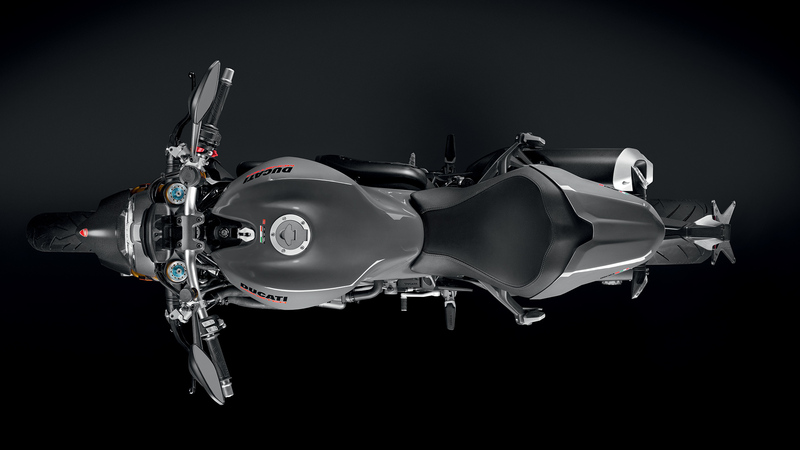 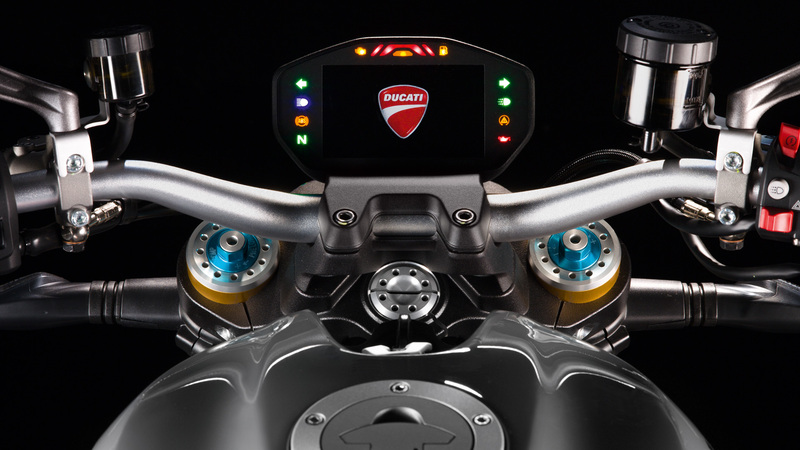 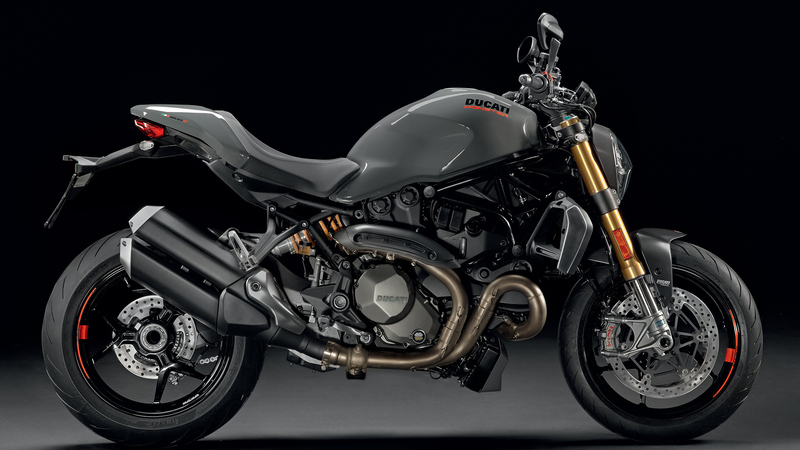 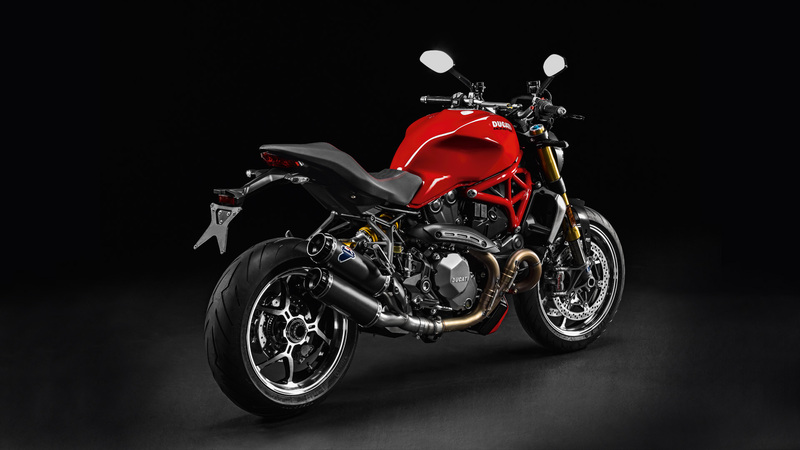 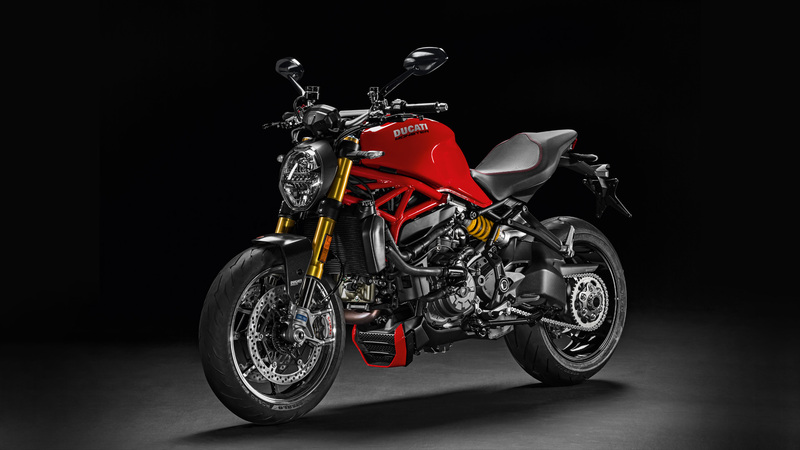 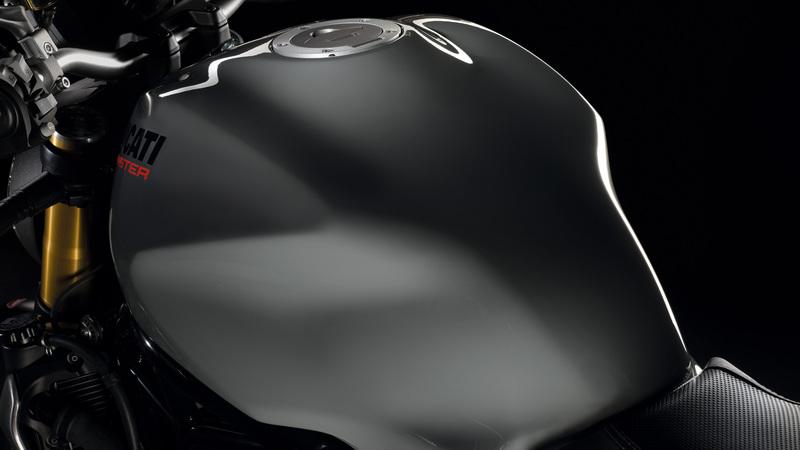 The Monster 1200 engine is the Testastretta 11° DS twin-cylinder, 1198 cm3 with 4 valves per cylinder, liquid cooled. 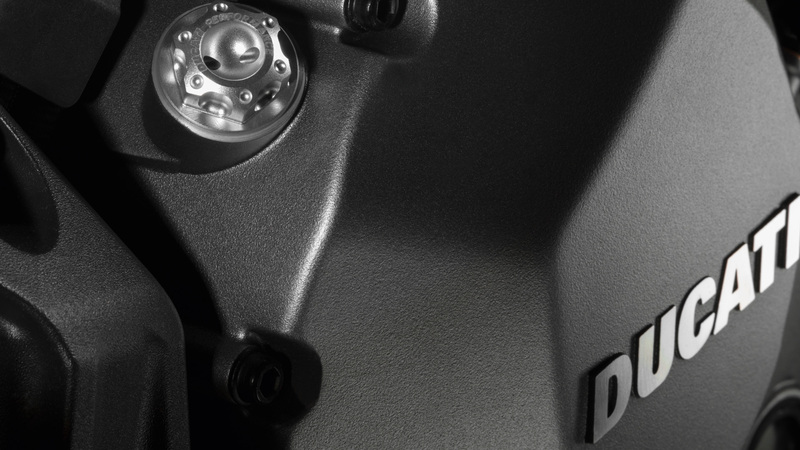 Euro 4 type-approved it is the structural element of the suspension set-up with coupling points for the trellis frame. 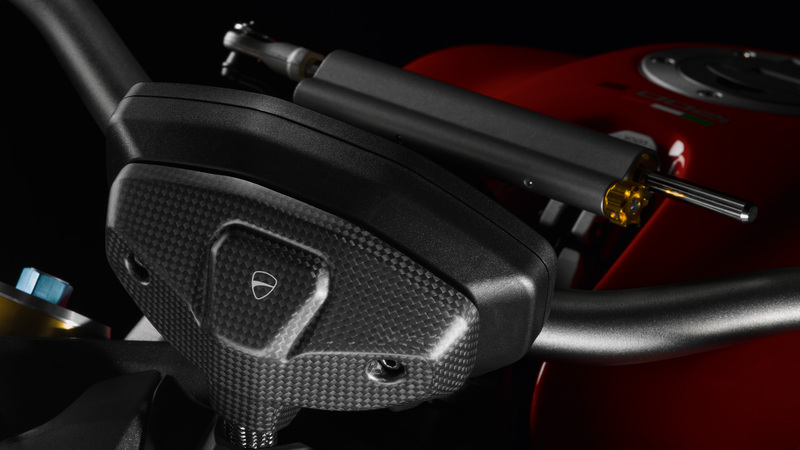 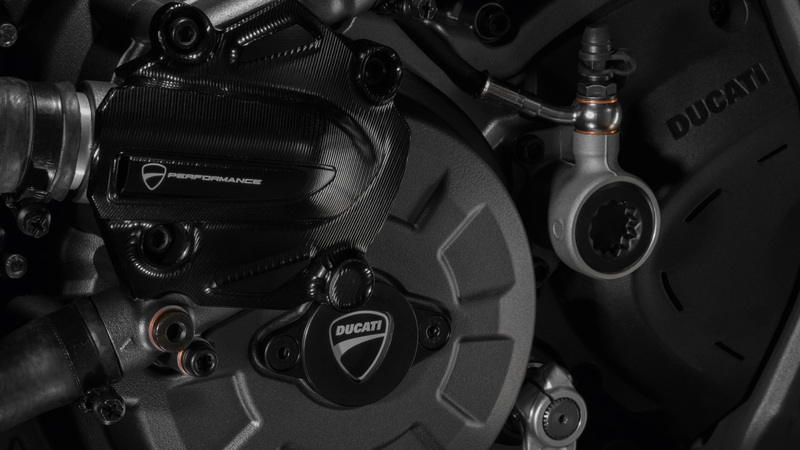 The 1198 Testastretta 11° DS breathes through the Ride-by-Wire Mikuni throttle body with oval cross-section with a diameter of 56 mm with two spark plugs for each head: the double flame front ensure combustion is completed extremely quickly which, together with the secondary air system optimising operation and reducing cyclical dispersion of the combustion without any impact on pollutant emissions, translates into a more regular distribution providing a more pleasurable and exciting riding sensation. 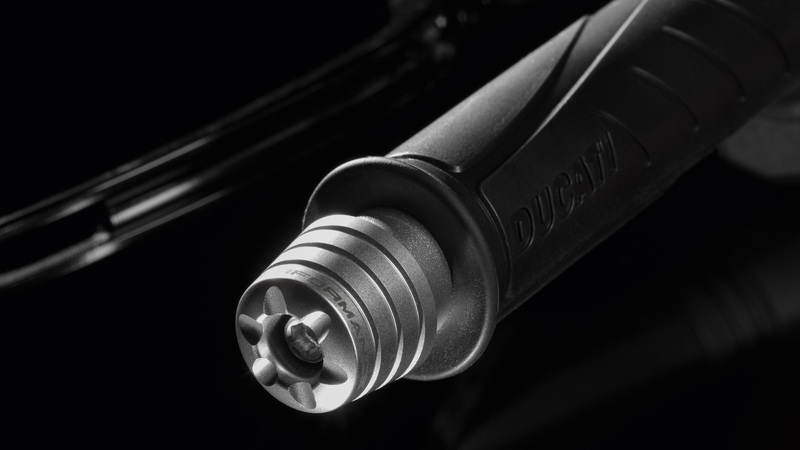 Great attention was paid to improving engine response in terms of modulating the engine response times to the actions on the accelerator. 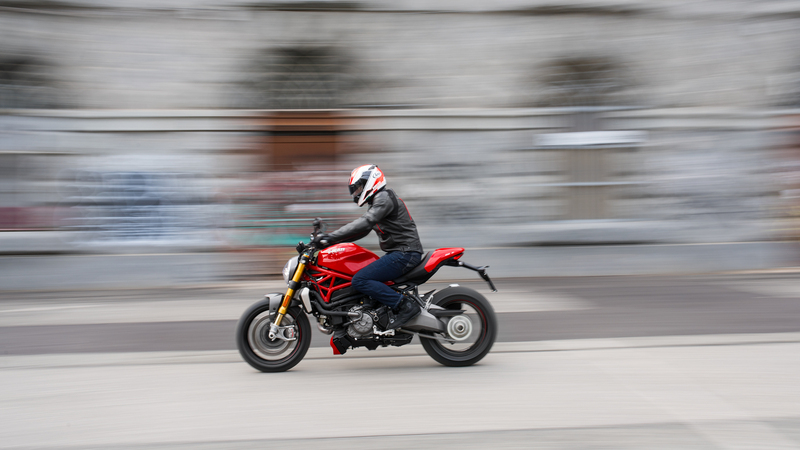 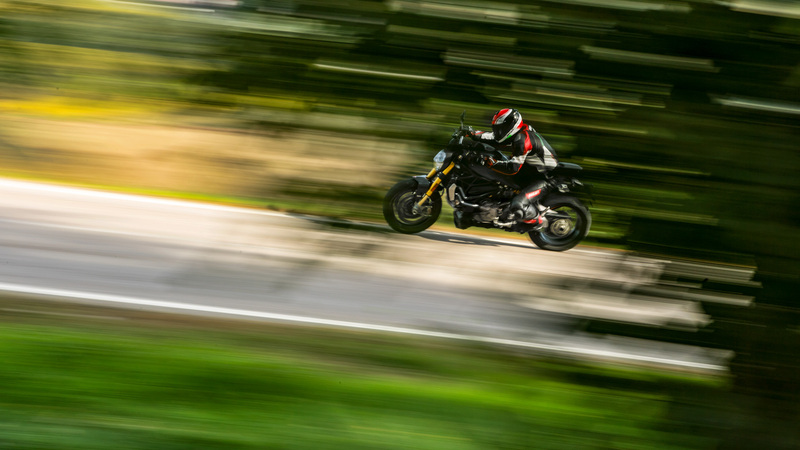 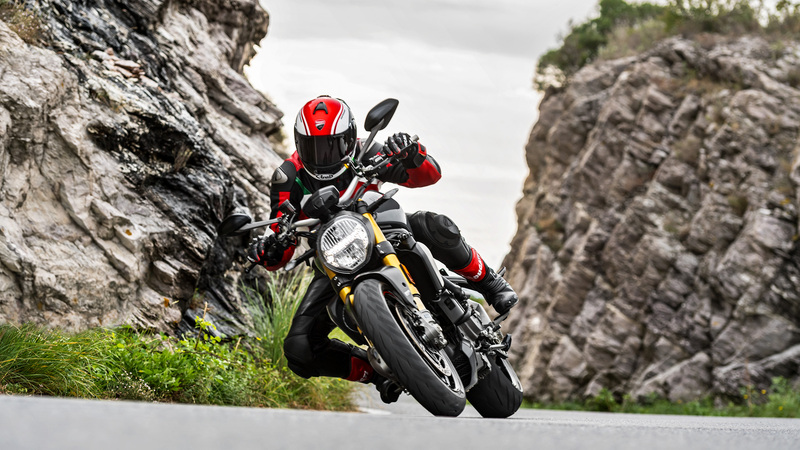 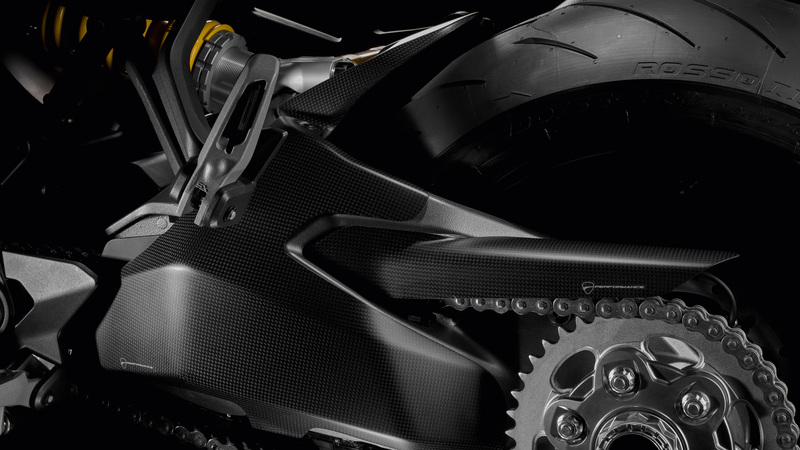 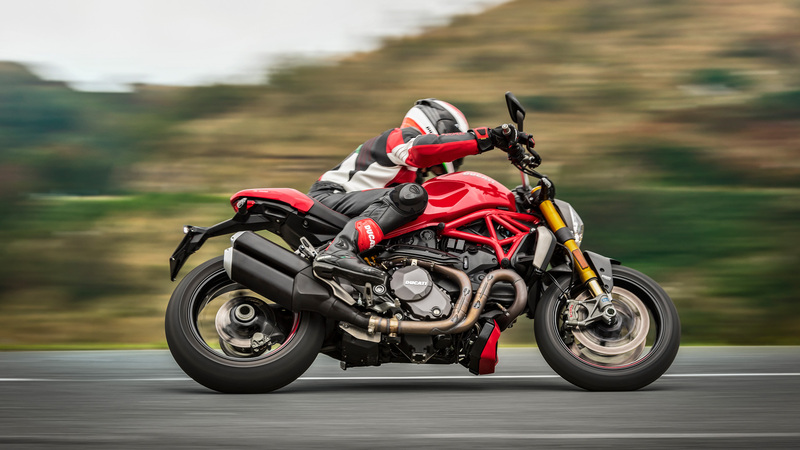 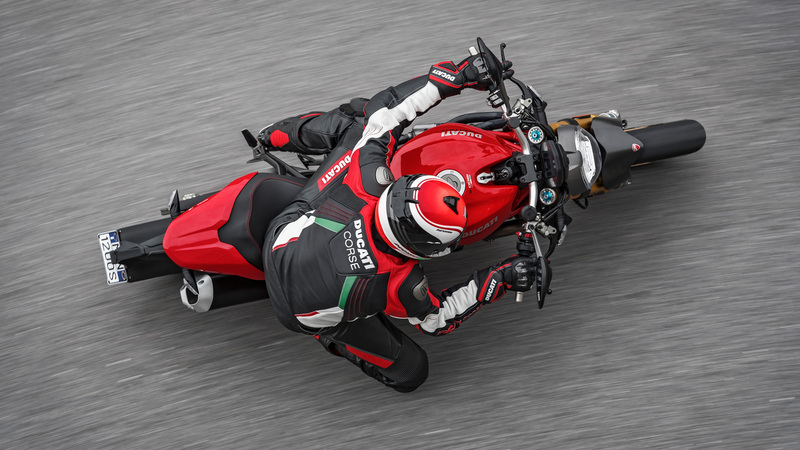 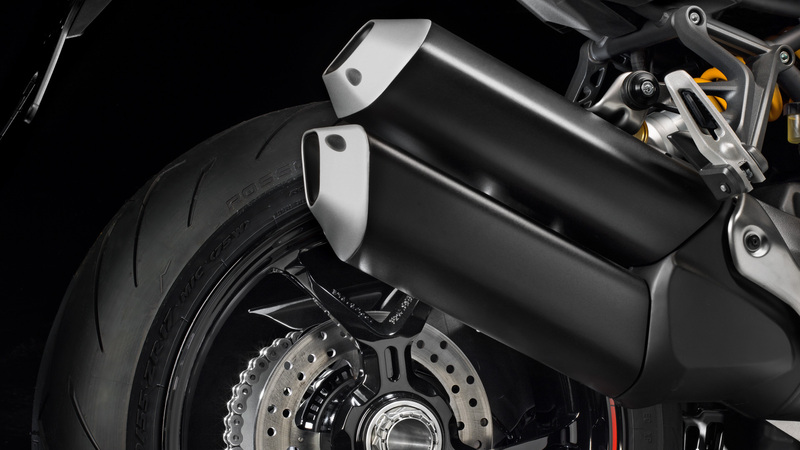 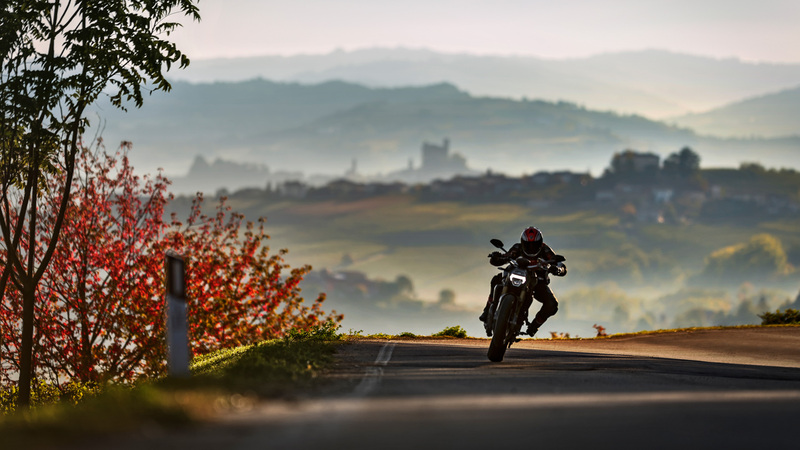 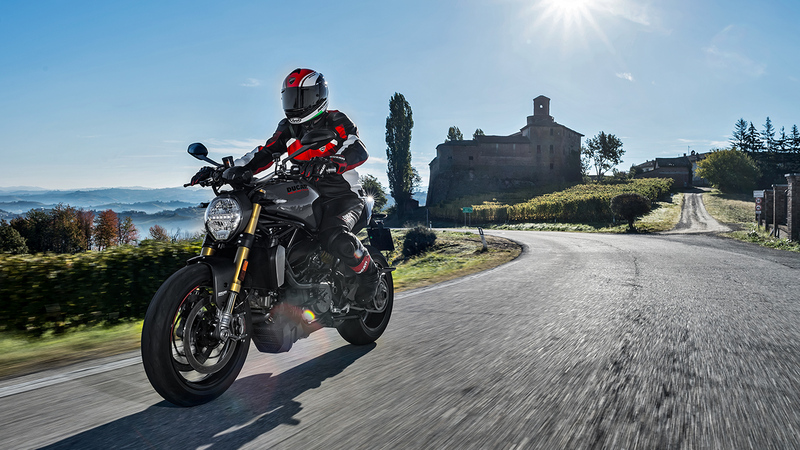 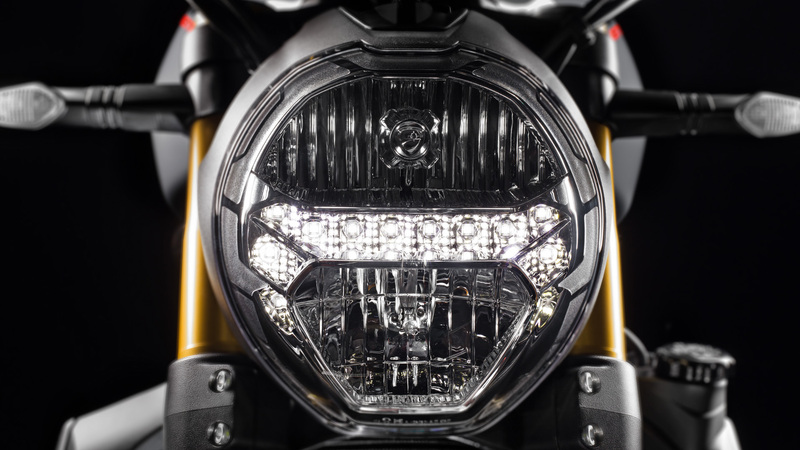 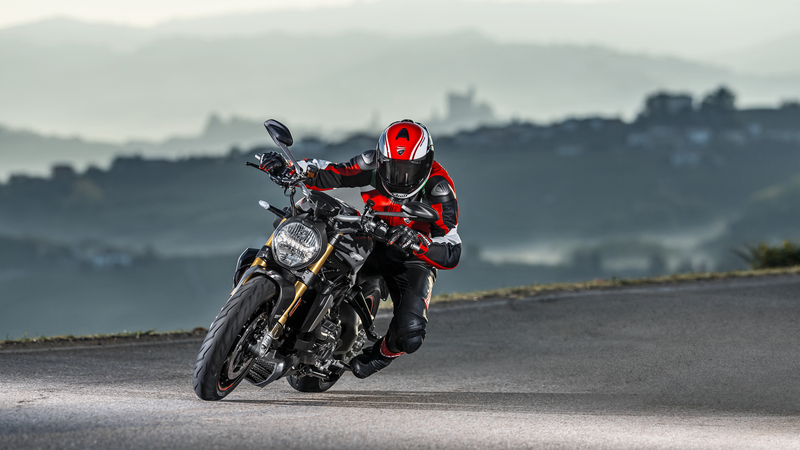 The Testastretta 11° DS engine is coupled to an impressive side-mounted 2-1-2 staggered shotgun exhaust that makes no secret of the performance of which the new Monster 1200 is capable. 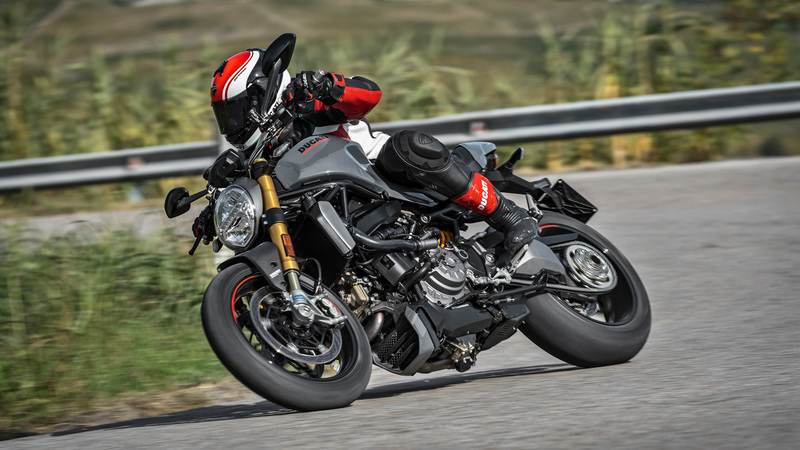 The Testastretta 11° DS engine is coupled to an impressive side-mounted 2-1-2 staggered shotgun exhaust that makes no secret of the performance of which the new Monster 1200 is capable. 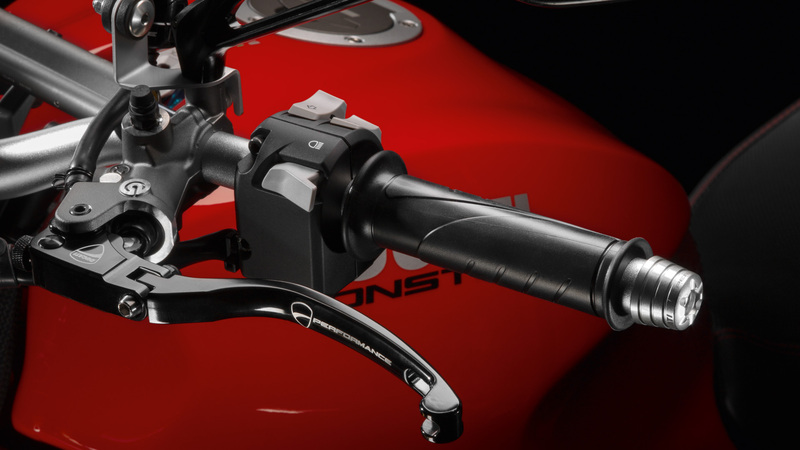 The engine management system dedicates a lambda probe to each header, providing precise fueling, while the sports cannon-style, vertically stacked silencers carry catalytic converters to provide Euro 4 conformity. 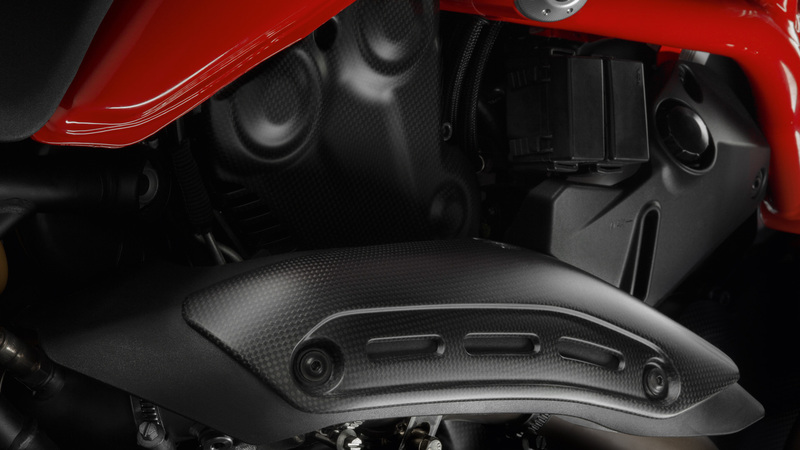 An electronically controlled mid-section valve optimises exhaust pressure throughout the rev-range. 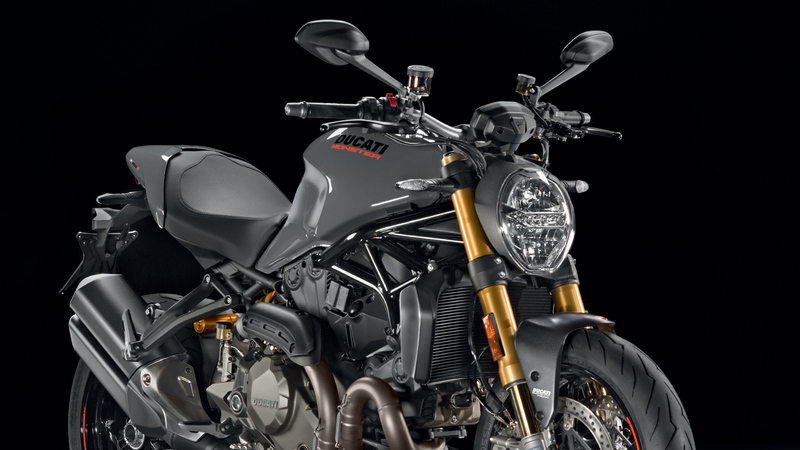 The new Monster 1200 is fitted with an adjustable seat (± 25 mm) that can adapt to the needs of riders all over the world. 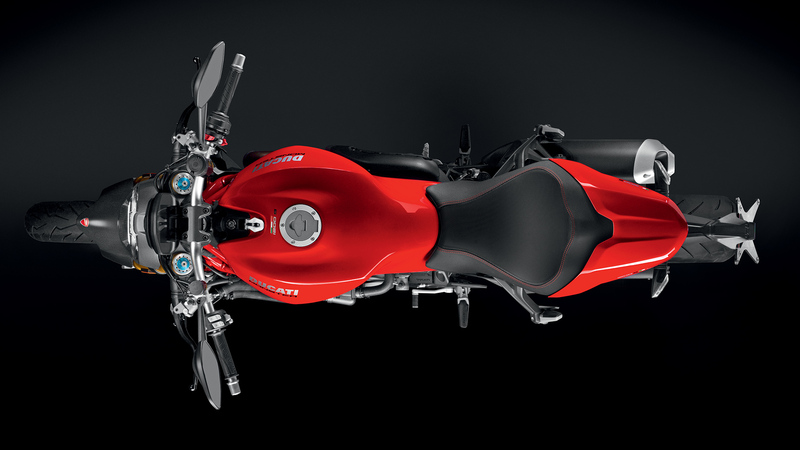 The standard seat height can easily be adjusted to the lowest (795 mm) or highest (820 mm) positions. 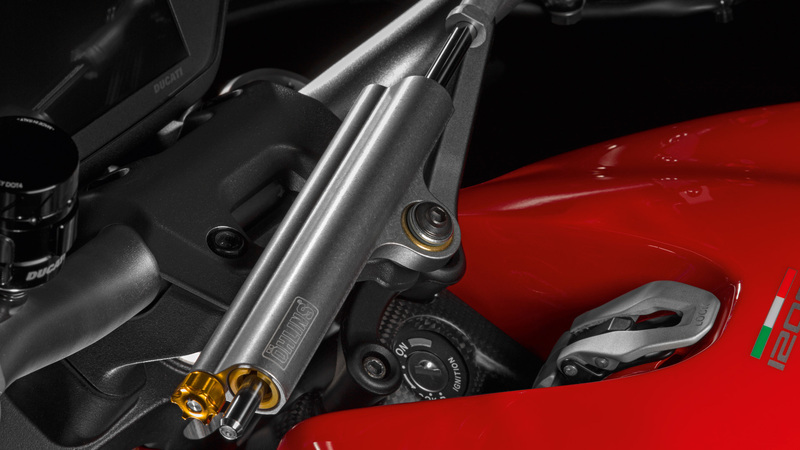 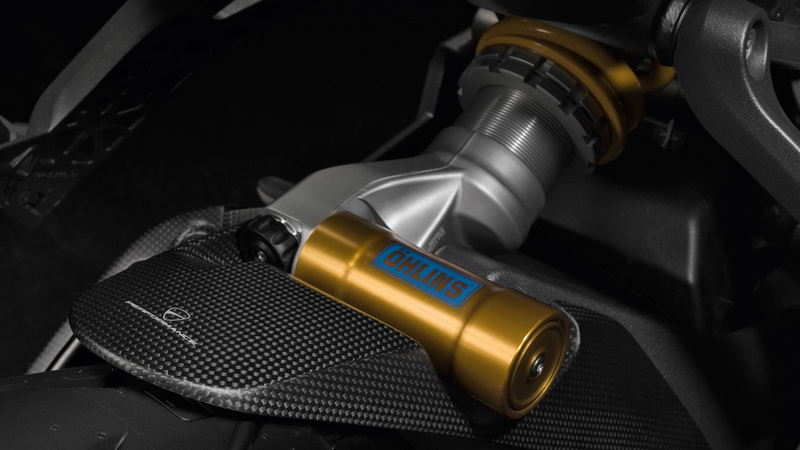 The Monster 1200 S has a fully adjustable 48 mm diameter Öhlins fork front suspension. 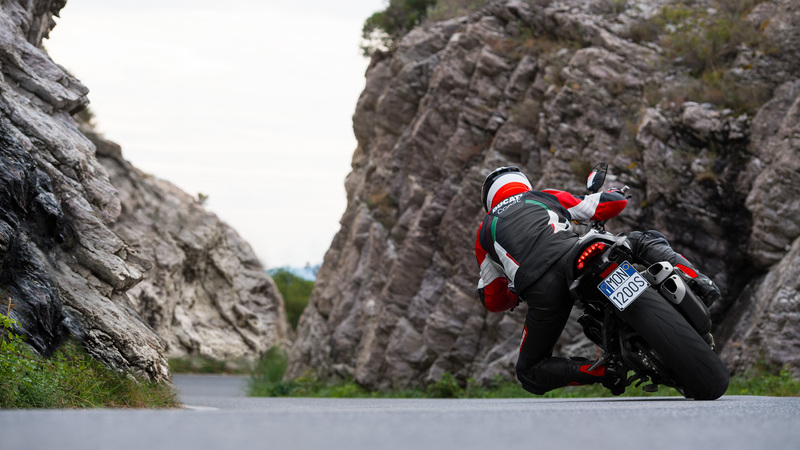 Events World Ducati Week 2018: the countdown has started! 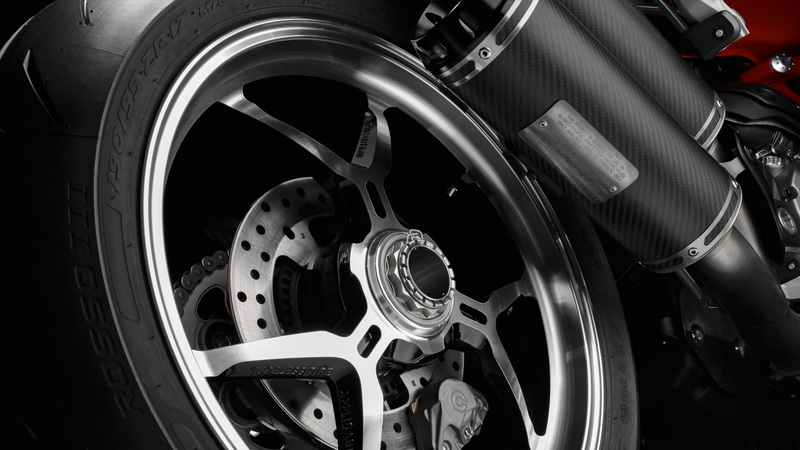 Prices quoted are SRP's including 20% VAT and the cost of Pre Delivery Inspection. 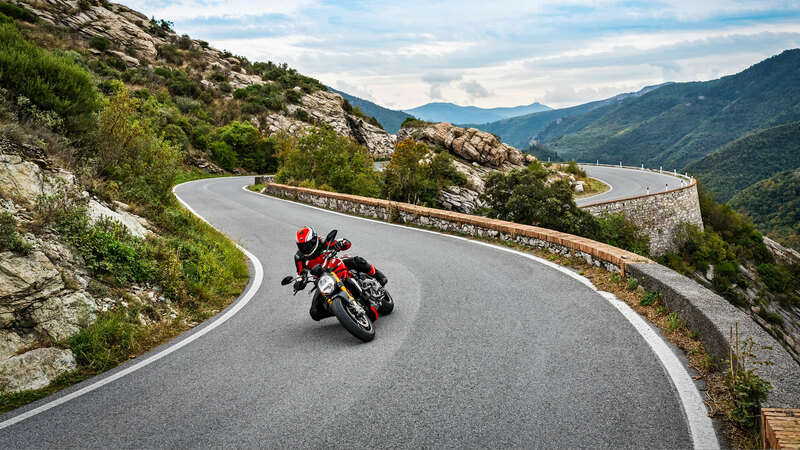 Registration fee, number plates and road fund licence are not included.